left off last time.. being the eve before my 22nd birthday. I was so bored today at work that I worked out that it was actually 200 days since i left, when i sent my last group email. Now its.. 212. Ok lets move away from maths. Well my birthday was fine, I think when you get older you really dont bother about it really, I had a good day, we went to church at all souls, and then Hillsong London. Hillsong London… exactly the same as hillsong. Even the leaders and singers and everything were australian. Its quite patronising to be honest, the church was established over there in 1992, and they still have it all run by australians. anyways yeah we went to lunch at Wagamamas, of course! Oscar came along too. Then Lou, Oz and me went for a coffee, then Dad Lou and I went to the movies and saw American Dreamz. Was alright. I got one present, that was off my mate Hadleigh in New Zealand, thanks Hads, your so hot. Everyone else, isnt hot. Not impressed. So yeah Lou flew home the next day and there was this big stuff up with the tickets and Louise didnt exist on the plane, like she does exist, I didnt make her up, but somehow the travel agent never issued her with a ticket number. Anyways after some stress we managed to get her on the plane. But ironic, she got home and her bag was left at London Heathrow. But she got it back and she is all safe and well. Glad you are Lou. Then Dad and I had 4 days of touring London. It was cool cause I saw so many things I either didnt know about or hadnt gone to. St Pauls, where you can go to the top and see things, higher. And the big parks, like Regents park. The days were quite warm, and its amazing to see London just strip. I dont mean that in a rude way, well, its just so bizarre to see women in bikins and i even saw a man take his business suit and lie in the sun in his briefs. It wasnt even that hot. Ah well, bless em. Went to Maddam Tussauds too and we saw famous people made out of wax. I got my photo with John Howard, Australia’s Prime Minister. He was next to Jamie Oliver. Dont ask me what the connection was. And there was this section there called Horror house LIVE. Where you go through a few people at a time through these passages with cages and ripped up sheets and live actors jump out around you and pretend to be crazy murderous mental patients. Its not that fun really, haha but it was worth it, I went in first and Dad behind me and I have never heard my own Dad shout out so many times in genuine fright “ah” “ahh”. I chuckle even now. I had a great time with Dad, and was good to see both him and Lou. Dad left early Saturday morning. The night earlier, I went out with mates for my birthday. So was kind of weird to be back alone in London (violins, and maybe a double bass start playing). But my days have been so busy since Dad left. Saturday I was so tired but went to mate Jamie’s birthday lunch. I planned to stay for a bit then go home to bed, but no, what happens?? I get convinced to come to the pub. Then convinced to go to go out. But it was such a RANDOM night. We snuck into a packed out club, where the street outside was filled with people wanting to get in, we got in through this fire exit. And then even cooler, I found out Bjork was DJ-ing, i looked across and there she was just standing there playing with records and stuff. Hey Bjork. Was a great night, met lots of random people. Sunday was big long sleep in and then this week has been back at Discovery channel. Am waiting on some jobs so thought, why not get paid to work back there, they need help, so am doin them a favour, they are doing me a favour, we are all happy children. Though was cool to see everyone here again. I wont be here long though, hope just a few weeks. 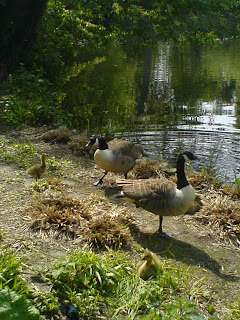 OH and the baby geese are getting bigger. I am taking photos, I will put em on my website soon, when I remember, plus I also gotta remember to buy light globes while i think of it. Every night i regret it! I have to use these stupid chinese lanterns. Well I hope I have also reminded everyone else who needs light bulbs, to buy some, and there I will leave it. Right, Im settled on my bed, laptop well.. on my lap, ready to type about the latest stuff. Well Dad and Lou arrived here safely 2 weeks ago, and I met them bright and early at the airport. Like early, in the fact I had never seen the tube that quiet in a morning before. Was so surreal to see them, cause it was like I had seen them yesterday, and my whole life in London was the dream. We had a few days in London and I showed em around and we fit a lot in that short space of time. Maybe I could be a tour guide and make some pounds. Lloyds Luscious tours. yeaaah sounds pretty swell to me. We even got the boat up to Greenwich and stood the the Prime Meridian. Lou was so excited. She did this little dance, in a triangle, with her arms in the shape of a pretzel. 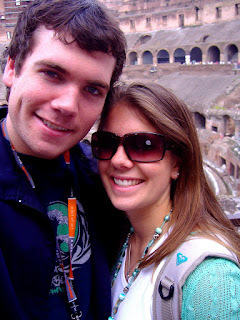 Then we flew off to Rome. Man is Rome not what I expected. There was tonnes of buildings, literally, they weigh a lot, just so old. Everywhere you go, there is something so old. Its such a busy city. We had a little hotel a block away from the Colusseum, and it was something very interesting. We got told to look our for Gypsies and cars. Lou and I imagined Esmareldas out of Hunchback from Notre Dame dancing around, but didnt see any. The Colusseum was amazing, to be standing inside, and shutting your eyes imagining the crowds and noise and the busy happenings. I loved it. But I started to get the flu from then on, but tried to ignore it. We saw the spanish steps and all this other old stuff, before we caught a train down to Naples. Ok, naples is disguisting. The square in front of the station was like a developing country, not sort of what you imagine Italy to be like. We stayed in our hotel room, once we found one. Booked a tour of Pompeii, that picked us up from the hotel, an hour late, which was a nice surprise cause we didnt expect to see Pompeii anymore, so its a good strategy, was nice of them. Lou and I got sick of the tour guide and hid behind an old wall and went off and explored Pompeii by ourselves. Now, Pompeii was fantastic, its sooo huge and amazing. The best bit of Italy for me. We didnt have time to see it all, but I just love the past and an entire city that has been uncovered, its GREAT concept for me. I got a lot sicker after that and spent the final days in Rome in my hotel room, hearing people wash up dishes in the alley in italian. Though I also cant think of italian food and not feel ill now. I think I just had too much, all I had was pizza or panini or pasta. I didnt know what anything else was in the menus.. I craved fresh fruit and salad. but no, i had carbs. So we got back to London on Wednesday and have spent the last few days enjoying London, and English. Our hotel is right next to the British Museum, and so very central. We went to Camden Town Markets today, was cool, i enjoy them, there is just so so many stalls and the vibe is very alive. Sunday is tomorrow and its my birthday. I dont really have any plans apart from having Wagamamas for Lunch with a few mates and Dad and Lou, only have one present to open, from my good mate Hadleigh in New Zealand, thanks Hads! Lou goes home on Monday, so wont have a late one either. Dad and I will just do stuff for another week, before he heads off then and i go back to work. Fun stuff! Oh and of course, the biggest news of all, my Geese Jake and Blake, have hatched their goslings. Fluffy yellow things, im so proud of them. Spring is very much here. The last two days we have had weather of 28 degrees and 24 degrees. Very Rad indeed. I sign off here. Keep safe everyone on the road tonight.